Xander Bogaerts, who came off the bench to play shortstop in the tenth inning, snapped a 4-4 tie with a run-scoring single in the eleventh. Deven Marrero drove in two more runs in the inning as the Red Sox, who had trailed by three runs almost as soon as the game began, rallied to beat the Blue Jays. In addition to collecting 12 hits, the Red Sox drew 14 walks. It was the most walks by the Red Sox since April 16, 2014, when Boston had 15 BB in a 14-inning game against the White Sox. Before that, the Red Sox had 14 walks in a nine-inning game at Baltimore on April 7, 2006. The team record is 18, on September 17, 1920, when the Red Sox lost to the Tigers 14-13 in 12 innings. Boston was 6-for-23 with runners at second and/or third. 23 AB! Doug Fister (5-4-3-3-5, 100) gave up a three-run dong to Justin Smoak in the first inning. Over the next 10 innings, however, Toronto would manage only four hits. Marco Estrada (4.1-2-2-7-3, 94) walked two Red Sox batters in the first. He loaded the bases on three walks in the third with no outs, but Boston could not make him pay for his wildness. Andrew Benintendi fouled to the catcher, Dustin Pedroia popped to second, and Mitch Moreland struck out looking. In the sixth, Marrero and Benintendi drove in runs to give Boston a 4-3 lead, but Troy Tulowitzki homered off Heath Hembree in the bottom half to tie things at 4-4. Matt Barnes walked two hitters with one out in the seventh, but got a strikeout and a groundout. Betts doubled with one out in the eighth and Benintendi walked, but Pedroia grounded into a double play. Boston also had a man on second with one out in the ninth, but Jackie Bradley popped to third and Christian Vazquez flied to left. 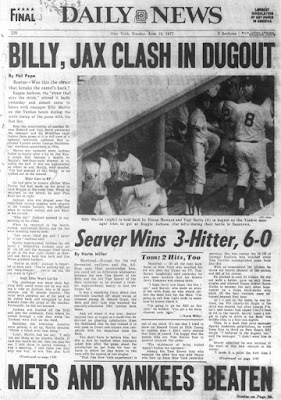 Blaine Boyer pitched the ninth and tenth innings, allowing a one-out single in the ninth and setting the Jays down in order in the tenth. Hanley Ramirez doubled to center. Bradley singled to right center, Ramirez to third. Vazquez lined out to right. Bogaerts singled to right, Ramirez scored, Bradley to second. Bradley stole third, Bogaerts stole second. Marrero singled to right, Bradley and Bogaerts scored, Marrero to second on throw. Betts safe at first on error by second baseman Goins, Marrero to third. Betts to second on fielder's indifference. Pedroia grounded into double play, shortstop to second to first. Craig Kimbrel faced only three batters in the ninth, striking out Kevin Pillar and retiring Luke Maile and Jose Bautista on flyballs to right. If you listened to last night's game on NESN, you might have heard (like, 50 or 60 times) that the Red Sox are beginning a "long" road trip tonight. It's actually only 10 days and includes three cities, which is a pretty normal road trip. (The Red Sox had a ten-game trip earlier this year (May 29-June 8) and they will have a nine-game trip in September.) This one will take the team to Toronto, Texas, and Tampa Bay - and then it's the All-Star break. Fister is making his second start for Boston. He allowed three earned runs in six innings against the Angels last Sunday. Was another rag-arm going to shut down the Red Sox*? Last night, Adalberto Mejia (4.93 ERA, 1.577 WHIP) pitched 5.2 scoreless innings. In this one, Kyle Gibson (6.23 ERA, 1.831 WHIP) was beginning the fourth inning with a 3-0 lead. * Mookie Betts said No. He led off the fourth with a homer into one of the light towers in left. The Red Sox took the lead with three in the fifth, highlighted by Jackie Bradley's double off the now-ornamental ladder in left. Hanley Ramirez went deep in the sixth and Tzu-Wei Lin tripled and scored in the seventh. David Price (7-6-3-0-7, 112) pitched well, outside of a rough patch in the fourth (when a Twins rally was extended because he failed to cover first base on a grounder to first). Price finished strong, though, retiring his last six batters, four by strikeout. He faced 27 batters overall and went to a three-ball count only four times (none of them coming after the fourth inning). Brian Dozier began the game with a double to left-center. Price got the next three batters, but Dozier came around, scoring on Joe Mauer's grounder to short. Robbie Grossman hit a ground-rule double to start the fourth. Mauer grounded to Mitch Moreland at first, but Price was late getting off the mound, and because Grossman thought the ball might have been caught, he had to stay at second (so much for being in "scoring position"). Price bore down. He struck out Miguel Sano and got Eduardo Escobar on a fly to right. But Jorge Polanco bashed a 2-2 changeup off the top of the Wall, missing a home run by maybe one inch (seriously). Both runners scored and Minnesota led 3-0. Betts's home run in the fourth was his 13th of the season, but only his second at Fenway. Ramirez walked to open the fifth - and scored from first when Bradley's opposite-field double hit the ladder, bounced up a bit, then fell straight down. Christian Vazquez was safe when his grounder to Polanco hit off the shortstop's wrist for an error. The runners moved up when Lin grounded to the pitcher and Bradley scored on Deven Marrero's dribbler to third, tying the game at 3-3. Betts's grounder up the middle threaded the needle, getting past both the shortstop and second baseman, scoring Vazquez and giving Boston the lead. With two outs in the sixth, Ramirez banged a 3-0 pitch over the wall in dead center. Boston bashed Buddy Boshers in the seventh. Lin tripled to deep right. Max Kepler raced back and waved his glove at the long drive, but could not catch it. Marrero then doubled to left, making it 6-3. Joe Kelly retired the side in order in the eighth, but he needed 27 pitches (12 of which were to Robbie Grossman). In the ninth, Craig Kimbrel also had a 12-pitch battle, with Escobar, who ended it with a one-out single. Polanco flied to the track in right for the second out and Kimbrel fanned Kepler. The Red Sox did not issue a walk to the Twins. Bradley went 3-for-4, and his one out was a smoking liner to first base that Mauer caught at his shoe tops. The Red Sox had at least one baserunner in every inning. In the seventh, they squandered a bases-loaded/one-out situation, getting only one run on a groundout. They ended the evening with 11 men left on base. Boston did absolutely nothing against Minnesota's mediocre starter, Adalberto Mejia (5.2-5-0-1-3, 101), who began the night with a 4.93 ERA and a 1.577 WHIP (with 5.3 walks/9). Mejia had lasted more than five innings in only two of his 10 starts. ... Make that three of 11, now. First of all, though, Porcello gave up two first-inning runs. He got the first two batters, but Joe Mauer doubled to the opposite field and scored on Miguel Sano's double into the left field corner. Max Kepler blooped a single into right to make it 2-0. The bottom of the third seemed promising as it began with singles from Deven Marrero and Mookie Betts. But Dustin Pedroia popped to shortstop and Xander Bogaerts struck out, chasing a changeup down and away. Marrero stole third, but Mitch Moreland also struck out. Porcello held the Twins in check until the sixth, when he walked Sano on four pitches to open the inning and gave up a line-drive home run to right-center to Kepler. In the seventh, facing Tyler Duffey, Sandy Leon singled to right. Tzu-Wei Lin pinch-hit for Marrero and flied to center. Duffey then walked both Betts and Pedroia. (Home plate umpire James Hoye shrunk the strike zone (i.e., changed the rules) in this inning (actually the zone was much smaller for the final three innings; ball four to Pedroia was an obvious strike.) Boston had the bases loaded, and the potential tying run at the plate. Bogaerts chopped a weak grounder to shortstop. Jorge Polanco's only play was to first base, and a run scored. Taylor Rogers came in and struck out Moreland to end the rally. In the eighth, Robby Scott came in with a man on second and one out. He intentionally walked Eduardo Escobar and then unintentionally walked Eddie Rosario, loading the bases. But he escaped by striking out Polanco. The Red Sox could not rally in the final two innings. Jackie Bradley was hit by a pitch with one out in the eighth, but Sam Travis struck out looking and Leon flied to left. Mookie Betts doubled with one out in the ninth (he leads the AL with 26 doubles), but Pedroia grounded to shortstop and Bogaerts waved at a 1-2 pitch well out of the strike zone. NESN's Graphic of Useless Clutter was back tonight, appearing 45 times. And in exactly 0 of those times was any useful information transmitted. The correct answer is 9. Also from Cut 4: Royals catcher Drew Butera (an eight-year MLB vet) had trouble catching Oklahoma softball pitcher Paige Parker. His teammates were amused. Dave O'Brien: Dustin Pedroia took a walk in the first inning. Hitting .289, two homers. . . . And lots of hits against Minnesota in his career - .360, his career batting average. Against the Twins - how about this? - only two guys have a higher career batting average in major league history. One is Mark Teixeira, who of course retired after last year, .362. The other? Ty Cobb. .378. Dustin Pedroia, .360. Dennis Eckersley: They were called the Twins back then? I mean, when Cobb was playing? What was their name back then, I wonder? ... Just curious. O'Brien: I'm looking. ... I think so. "They were called the Twins back then?" ... "I think so." Listening to the conversation, you can tell Eckersley is baffled. He knows something is not right, but either he's not completely sure (though that has never stopped him in the past (actually, see below)) or he doesn't want to blatantly expose O'Brien. Also, if O'Brien was "looking" for an answer to Eck's question, as he says, why did he not find (and tell us) the right answer? As soon as the words were spoken, I fully expected O'Brien to realize he had made a mistake or for someone in the production truck to tell him the correct info, so he could quickly save face. But there was no correction in the bottom of the third. Or the top of the fourth. Or the bottom of the fourth. O'Brien: - in the time of Ty Cobb. O'Brien: So it all comes under the banner, these days, of the Minnesota Twins franchise. You're talking about records against them. Man, that is one awkward correction. How hard would it have been to say: "We were talking earlier about Dustin Pedroia's .360 career batting average against the Twins and how Ty Cobb was one of only two players to have a higher average. Of course, Cobb never played against the Twins, they began in 1961, well after Cobb's playing days. But before this team was the Twins, they were the Washington Senators - and it was the Senators that Cobb played against. Major league baseball considers the Senators and Twins to be one franchise." I'm now thinking that the guys in NESN's production truck have decided to leave O'Brien high and dry any time he makes a mistake. Tonight's error was not the first time this has happened this season. In early May, when the Red Sox were in Milwaukee, O'Brien misspoke in the first game - and no one corrected him. He gave viewers the same wrong information during the next game - and no one corrected him. The following night, he gave the wrong information yet again - and still no one corrected him. I found that strange, first that O'Brien would bungle such basic information and second, that despite giving the wrong information for three consecutive nights, no one bothered to correct him. The Red Sox took sole possession of first place as Drew Pomeranz (5-4-1-0-7, 83) did not allow an earned run in five innings that included two hours of rain delays. Someone Named Christian Vazquez hit his first home run of the year, Dustin Pedroia reached base four times and scored twice, and Chris Young crushed a three-run shot to put the game on ice. Pedroia and Xander Bogaerts singled to start the third as the Twins went to the bullpen after the delay. Jackie Bradley lined a one-out single to center. Pedroia stopped at third but then Buxton's throw from the outfield sailed to the backstop on the fly - and Pedroia scored. In the fourth, Vazquez walked and stole second. Deven Marrero lined the ball to right-center. Buxton raced over and tried making a diving catch, but the ball glanced off the tip of his glove. Marrero had a double but Vazquez could advance only one base, to third (so much for being in "scoring position"!). Vazquez came home on Mookie Betts's sac fly and Pedroia singled in Marrero, but FY was thrown out foolishly trying for a double. Bogaerts singled in the fifth and eventually scored on an error by second baseman Brian Dozier. Also, during the inning, Young and Bradley pulled a double steal without a throw. Boston had some two-out/no-one-on fun in the sixth. After two groundouts, Pedroia singled and Bogaerts reached on Minnesota's third error of the game. Young followed with a three-run homer to left. An error by Marrero allowed Polanco to reach with one out in the top of the fifth. He moved to second on a wild pitch, went to third on a single by Rosario, and scored on Buxton's single to left. This was actually a crucial moment in the game. Boston led 5-1, but there were two men on base with only one out. Pomeranz fell behind Castro 3-0. A walk would have loaded the bases and brought Dozier to the plate as the potential tying run. But Pomeranz rallied. He got a called strike, a foul, and a swinging strike to punch out Castro. Then he struck out Dozier (cbbss) to end the threat. In Chicago, the Yankees led 3-1 in the middle of the eighth. Domingo German and Tyler Clippard combined to walk four men and Clippard tossed in a wild pitch, but the White Sox scored only one run. In the bottom of the ninth, Dellin Betances loaded the bases on two walks and a hit batter - at that point Chicago had seven baserunners in 1.1 innings on no hits - and Jose Abreu singled in two runs to win the game. John Farrell was fined and suspended for one game for arguing a balk call in Saturday's game. He will serve the suspension tonight. Santiago is making his first start since June 6. He had been on the DL with a left shoulder strain. Left-handed batters have destroyed Santiago this season: 20-for-40 (.500/.608/1.000, 1.608 OPS) with more home runs (six) than strikeouts (five). The Yankees (41-33) and Red Sox (42-34) are tied for first place, although New York is actually .001 ahead of Boston. [T]he Yankees are not going to outrun their current problems by designating one underperforming veteran [e.g., Chris Carter] at a time. They now have lost nine of 11, fallen out of first place and very possibly revealed they already have played the best they are going to in 2017. What the Yankees did for the first 10 weeks is proving unsustainable. ... There is a lot of regression to the mean. And perhaps worst of all there are growing indicators the division might play out how expected, with Boston just a grade better than the rest of the AL East. General manager Brian Cashman ... has seen the best of the Yankees for 10 weeks and the worst the past two. There are five weeks until the deadline for these Yankees to reveal fully exactly who they are in 2017. I started wondering about the most pitches thrown in five or fewer innings. Of course, because pitch count data does not exist for most of major league baseball's history, we have a limited amount of data. I searched Baseball Reference's utterly awesome Play Index for games in which the starting pitcher recorded 15 or fewer outs and threw 120 or more pitches. I got a list of 81 games, all but two of which are since 1988. Most Pitches: Dennis Martinez of the Expos threw 136 pitches in five innings on April 13, 1991 against the Mets, allowing five hits and walking six. Fewest Innings: No pitcher for whom we have data has thrown 120+ pitches in fewer than four complete innings. Darren Oliver of the Cardinals lasted four innings against the Mets on June 19, 1999, throwing 121 pitches and allowing seven hits and five walks. Repeat Offenders: Several pitchers appear on the list twice, but only one man is there three times: Al Leiter, who had two such starts in 1999. Chris Sale: 6.1-4-1-2-9, 108. ... Mitch Moreland hit a solo home run in the first inning and drove in a run with a sac fly in the seventh. ... Tzu-Wei Lin (#73), recently of Portland (AA), made his first major league start, and singled in his first at-bat. Doug Fister: 6-7-3-3-6, 105 (pitched to two batters in the seventh inning). The Red Sox have acquired pitcher Doug Fister - and he will start against the Angels this Sunday. Boston tried to get the 33-year-old right-hander earlier this year, but were edged out by the Angels. However, Fister exercised an opt-out clause (because he was not on the Angels' major league roster on June 21) and became available, and was claimed off release waivers. Fister made three starts for Salt Lake City this year, with a 4.02 ERA (15.2 innings, 16 hits, 5 walks, 10 strikeouts). He's never been a big velocity guy, he's an average velocity, he even ticked a little bit below that the last couple years. But when we saw him, he was 89-90, good cutter, good curveball, knows how to pitch, good sink, holds runners well, he's a championship caliber makeup player. He's a quality individual, hard worker, great shape and we think he can help us. The Red Sox wasted little time in grabbing a lead. In the bottom of the first, Mookie Betts walked and stole second base. Dustin Pedroia walked. Xander Bogaerts (2-for-4) doubled for one run. Then two wild pitches by Alex Meyer scored Pedroia and Bogaerts. Hanley Ramirez hit a two-run homer down the right-field line in the fourth inning (Meyer tossed another wild pitch during Hanley's at-bat.) With two outs in the sixth, Jackie Bradley (2-for-3) walked and Sandy Leon (3-for-4) homered to right-center. Leon added a two-run double in the eighth. Rick Porcello (6.1-8-4-1-8, 102) looked much more like the guy we remember from last season, allowing only five hits, one walk, and one run through six innings. The Angels went double-triple-double against him with one out in the seventh and it was time for the bullpen. David Ortiz will have his #34 retired before tonight's game. It is Big Papi's first time back at Fenway Park since he retired last season. The ceremony will be streamed on MLB.com and redsox.com. Or click here. Yesterday afternoon, David Ortiz Drive was unveiled outside Fenway Park. The street was formerly known as Yawkey Way Extension and is located directly across from Yawkey Way, off Brookline Avenue. Porcello has given up 124 hits this season, the most of any major league pitcher. Opponents are hitting .358 against him in his last eight starts, during which he has had a 6.02 ERA. The Red Sox will retire David Ortiz's #34 tonight at Fenway Park. During his fourteen seasons with the Red Sox, David Ortiz built a reputation as the one player the team absolutely wanted at the plate with a chance to win the game in the bottom of the ninth or in extra innings. That was first evident during the 2004 American League Championship Series against the Yankees, when Ortiz had two game-winning hits in less than 24 hours in two must-win games for the Red Sox. A few days earlier, Ortiz had sent the Angels home for the winter with an American League Division Series-clinching home run. In the 2004 post-season, Ortiz bagged three walkoff hits in a span of four home games. Back in 2005 and 2006, when Ortiz came to the plate at Fenway Park with a chance to win the game, he never made an out. That is barely an exaggeration. When I compiled the data for the first version of this post (August 1, 2006), I noted that from the end of the 2004 regular season through July 2006, Ortiz came to the plate 19 times in a walkoff situation - and made only three outs. He had a .786 batting average (11-for-14) with seven home runs and 20 RBI! His July 31, 2006 home run off Cleveland rookie Fausto Carmona (later known as Roberto Hernandez) may be my favourite non-playoff Ortiz walkoff hit. Big Papi was on an amazing streak of winning games and had hit an extra-inning game-winner only two days earlier. With Boston down by two runs and two men on in the ninth, I probably would have bet my year's salary on Ortiz winning the game if someone had asked. It felt like everyone in Fenway Park knew it would happen, including Carmona. Maybe especially Carmona. The Cleveland pitcher threw two balls to build a little tension and then - BAM! - Ortiz crushed a three-run homer to center. All I could do is stare at the TV and laugh. 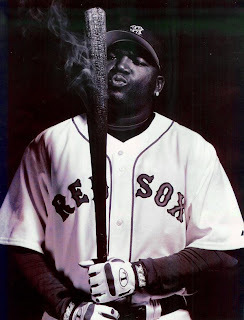 Ortiz - being human - couldn't keep batting almost .800 in walkoff situations. And at times, he was (admittedly) no longer that guy, the slugger who made pitchers quake in their cleats, but his past heroics remained in the back of everyone's mind when he spat in his batting gloves, clapped those big mitts together, and dug in. For years, a game-winning hit always seemed (to me, anyway) extremely likely. Of course, the walkoff opportunities listed below tell only a small part of Ortiz's story. But it is a huge part of Big Papi's legend, one that led to Ortiz being dubbed, officially, by the team, as The Greatest Clutch Hitter In Red Sox History. * Ortiz hit a grand slam in the bottom of the ninth the day before, but the Tigers led 6-1, so the Red Sox still trailed by one run. They lost the game 6-5. 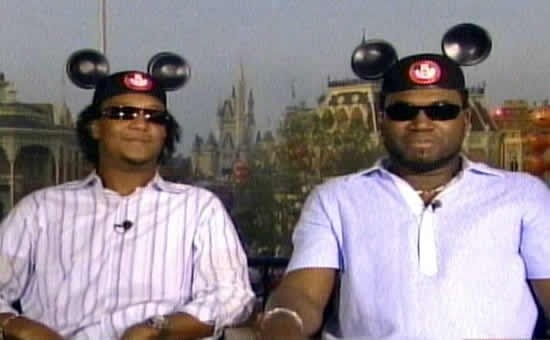 Pedro Martinez: "For My Compadre, Big Papi"
I'm gonna tell you something that should be no surprise. I know David has told this story before, but he's an old man now, and I have a much better memory than he does, so I want to tell it from my side. In December 2002, I was back in the Dominican Republic. We had finished the season 10½ games back of the Yankees, and let me tell you something — nobody hated to lose to the Yankees more than me. Nobody. It made me sick to finish behind them. I swear it was God whispering to me, "Lobster, Pedro. Go to the lobster." So I told my boys, "We're going to Vesuvio." When we walked in the place, David Ortiz was sitting at a back table, talking to somebody on the phone. David was my boy. When the Twins would come to town, I'd have him over my house for dinner and I kind of took him under my wing. I hadn't seen David in a while, so I snuck up behind him and gave him a big hug. But he wasn't smiling. He just kept on listening to the person on the phone. I don't think I had ever seen David not smiling. When I came back to David's table later, he still looked depressed. I said, "Compadre, what happened?" He said, "Can you believe this s***?" I remember Mike Mussina getting David over and over again with his curveball. I kept telling David, "If you swing at the first one he shows you, you're grounding out. Just let it go! If he falls behind in the count, he's going to go back to the curveball, but this time it'll be over the plate. Then you can get him." It seemed like every time he faced Mussina after that, he'd wait on the curveball and hit a bomb. Ortiz started off his career against Mussina 0-for-20, with 13 strikeouts. From 1998-2004: 2-for-29 (.069) in the regular season and 5-for-41 (.122) overall, including the postseason. And then ... over the next three seasons (2005-07), Ortiz batted .480 against Mussina (12-for-25). However, he hit only three bombs, and two of them came in the same game (May 29, 2005). Despite recent strong performances from just about everyone in the bullpen, I doubt I was the only Red Sox fan who began experiencing a growing sense of doom as Matt Barnes walked the first two Royals in the bottom of the eighth. Several of Barnes's pitches to Jorge Bonifacio were high, and he walked him on a full count. All four of his pitches to Lorenzo Cain were up, out of the strike zone. Boston held a 4-2 lead. Lefty Robbie Scott came in to face lefty Eric Hosmer, who had doubled and scored the Royals' first run. Scott's pitches: outside, low/outside, well outside, well outside. Kansas City had the bases loaded with no one out. Manager John Farrell has stated he would rather avoid using Craig Kimbrel before the ninth inning, and I don't think Kimbrel ever got off the bench in the bullpen. But Farrell was slow to have Heath Hembree warm up, given the assumption that Hembree (a righty) would pitch to Salvador Perez. But Hembree began warming up only after the walk to Hosmer and a mound visit by pitching coach Carl Willis. So it would be up to Scott. Scott's first five pitches to Perez were outside, making it 15 straight pitches out of the strike zone by Boston relievers. However, Perez swung and missed at two of those pitches, so the count was actually 3-2. Perez then fouled off three pitches, two of which were right over the heart of the plate. Scott's ninth pitch of the at-bat was a bit inside and that's what Perez was looking for. He crushed the ball to deep left for his 102nd career home run - and his first grand slam. Mike Moustakas then bunted against the shift, towards third, and reached with a single. Now it was time for Farrell to call on Hembree, who retired Alex Gordon on a pop up and got a double play from Alcides Escobar. Jackie Bradley doubled to lead off the top of the ninth, but Kelvin Herrera set down the next three batters: Josh Rutledge grounded to short, Christian Vazquez struck out looking, and pinch-hitter Hanley Ramirez flied to center. If the Red Sox had won the game, Drew Pomeranz (6.1-6-2-1-5, 93) would have received deserved attention for his solid start. He allowed two early runs. Hosmer doubled in the second and scored on a double play. Escobar doubled to start the third and scored on a sacrifice fly by Whit Merrifield. Vazuqez singled to open the fifth. Deven Marrero bunted towards first base. Pitcher Ian Kennedy fielded the ball as second baseman Ramon Torres rushed over to cover the bag. Kennedy's throw sailed over Torres's head - and Boston had runners at second and third. Mookie Betts brought Vazquez home on a fly to left. Marrero took third on Benintendi's fly out to Cain on the warning track in right-center. After Bogaerts was intentionally walked, Kennedy (4.2-3-4-3-4, 89) was pulled for Mike Minor. With a 1-2 count on Mitch Moreland, Minor threw over to first. The ball went past the first baseman and struck Red Sox first base coach Ruben Amaro in the right chest or shoulder. Marrero alertly scored, Amaro appeared to be okay (he apparently never saw the ball coming), and Moreland flied to short center. From the third inning into the ninth, Chris Sale retired 19 straight batters before a momentary loss of dominance prevented him from pitching his second complete game in a week. While Sale (8.1-4-3-1-10, 110) was mowing down the Royals, his teammates busted the game open in the middle innings. The easy victory, coupled with the Yankees' seventh consecutive loss, put the Red Sox in sole possession of first place for the first time this season. Sale actually trailed in this game for a few minutes. Mike Moustakas crushed a home run to deep right in the second inning. But the Red Sox tied the game in their next time at-bat, when Deven Marrero doubled and scored on Mookie Betts's single. Alcides Escobar singled to start the Royals third inning. The next Kansas City baserunner would come with one out in the ninth. Sale struck out 10 Royals, the 10th time in 15 starts that he has fanned 10 or more batters. The only other Red Sox pitcher to have at least 10 starts with 10+ strikeouts before the All-Star break is Pedro Martinez - of course - who had 11 in 1999. Matt Strahm (3-7-5-1-4, 75) was doing fine until the fourth, when the first four Boston batters reached base. Jackie Bradley singled to right. Sam Travis's fly to deep left landed at the base of the wall for a double - and the Red Sox led 2-1. Josh Rutledge lined a pitch to Moustakas at third. He dropped the ball and glanced at second base as he picked it up. That brief hesitation before throwing to first allowed Rutledge to reach safely. Strahm's wild pitch advanced the runners to second and third, and they both scored on Sandy Leon's double to right-center. Scott Alexander came out of the bullpen and, after throwing a wild pitch of his own, allowed Leon to score on a sac fly by Marrero. The bottom of the Red Sox order set the table off Kevin McCarthy in the sixth. With one out, Leon singled and Marrero walked. Betts flied out, but Chris Young doubled down the right field line, scoring one run. Xander Bogaerts brought in two more with a broken-bat single to center. Sale went to a three-ball count only once in his first 27 batters. (To retire the side in the sixth, seventh, and eighth innings, Sale needed a total of only 28 pitches (11-9-8).) With one out in the bottom of the ninth, a blown call by home plate umpire Gary Cederstrom led to a full count, and Sale walked Whit Merrifield. Then Jorge Bonifacio homered to left-center. Brandon Moss dropped a single into right-center and as John Farrell walked out to the mound, Sale was livid at himself for not finishing the game. Fernando Abad faced reliever Travis Wood, who was batting in the cleanup spot because DH Cheslor Cuthbert went in to play first in the previous inning. Wood grounded a 2-2 pitch back to Abad, who started a game-ending 1-6-3 double play. I listened to the WEEI broadcast while watching the game. If I had taken a drink every time Joe Castiglione mentioned a college by name, I would have died of alcohol poisoning well before the seventh-inning stretch. ... In the bottom of the fifth, Tim Neverett said Sale was leading the major leagues in strikeouts, but that Washington's Max Scherzer was close behind. Then Neverett seemed to go out of his way to add that Sale was also the American League leader in strikeouts. Update: Pablo Sandoval has been placed on 10-day DL with an ear infection. Also, Austin Maddox was optioned to Pawtucket, and Deven Marrero and Sam Travis were recalled. After making 41 relief appearances over the last two seasons, Strahm was given his first career start on June 15. In five innings, he allowed three hits, one walk, and one unearned run to the Angels. The Red Sox gambled last winter that Sandoval could have a bounce-back season. Instead, he's batting .212 with four home runs and a .623 OPS in 32 games. Since his return from a month-long absence because of a knee sprain, he's 7-for-35 [.200] with 2 extra-base hits, 3 walks and 11 strikeouts. And he continues to exhibit limited range at third base. Josh Rutledge is certainly not the answer. Since May 31 (16 games), he's hitting .178 with a .504 OPS. And He's 2-for-21 (.095) with 10 strikeouts in his last seven games. Red Sox third basemen are batting .200 this season (28th out of 30 teams). They are dead last in both OBP (.253) and slugging (.312). Their MLB-worst OPS (.565) is a whopping 56 points below the #29 team, (Philadelphia, .621). After the Royals scored two runs off Blaine Boyer in the seventh, the Red Sox tried to come back, but left the bases loaded in the top of the eighth. Andrew Benintendi tripled with one out in the ninth, but nothing came of it. Hector Velazquez (5.1-5-2-0-3, 77) did his job, but the bullpen failed. With one out in the seventh, Drew Butera lined the ball to center. Jackie Bradley dove to his right, but the ball skipped past him and rolled to the wall for a triple. Whit Merrifield fell behind in the count, but chopped a single into left, snapping a 1-1 tie. After a groundout moved Merrifield to second, Lorenzo Cain sliced a single to right to make it 4-2. Mike Minor relieved Jason Hammel (7-7-2-0-4, 91) in the top of the eighth. Hanley Ramirez and Bradley both singled with one out. Josh Rutledge struck out, but Chris Young, pinch-hitting for Pablo Sandoval, walked on four inside pitches. Christian Vazquez grounded slowly to third, but Cheslor Cuthbert's throw just nipped the runner, and the Red Sox declined to challenge the call. Eric Hosmer hit a long two-run home run to deep left-center in the third. The Red Sox answered that in the fourth when Ramirez singled and Bradley homered to right. In his first ten starts this season, Jason Hammel had a 6.18 ERA and an opponents batting average of .306. He changed his motion a bit - squaring his shoulders to the plate from the stretch - and has had a 2.21 ERA in his last three starts. Hector Velazquez threw 3.1 shutout innings against the Phillies on June 14. Let's see more of that guy. MFY News: The Yankees are off tonight, but begin a series at home against the Angels tomorrow. Infielder Gleyber Torres (the #2 prospect in all of baseball according to MLB Pipeline) will have season-ending Tommy John surgery. Xander Bogaerts hit two home runs and drove in four runs, Andrew Benintendi threw out a runner at home in the bottom of the eighth inning to preserve Boston's one-run lead, and Christian Vazquez gunned down Derek Fisher to end the game when Fisher tried to steal second base. The win moved the Red Sox (39-30) into a first-place tie with the Yankees (38-29), who have lost their last six games. David Price (5-8-3-3-3, 107) was fortunate to have allowed only three runs. The Astros stranded seven baserunners over the first three innings, including leaving the bases loaded in the second and men at second and third in the third. Bogaerts homered in the first and he hit his second home run in the sixth, after Dustin Pedroia walked with one out. With two down in the inning, Hanley Ramirez singled and went to second on a wild pitch. Andrew Benintendi walked. Jackie Bradley doubled to right, scoring both runners, and Boston led 5-2. Jake Marisnick homered off Price to open the bottom of the sixth. That ended Price's night and Heath Hembree took over - and he gave up a home run to George Springer, making it a 5-4 game. Astros reliever James Hoyt hit both Mookie Betts (right knee) and Pedroia (left side) in the seventh. The umpires issued warnings to both teams as a pissed-off Pedroia yelled out at Hoyt. (Pedroia was taken to a hospital for x-rays.) The Astros brought in Chris Devenski and Bogaerts promptly singled home Betts. In the bottom of the ninth, trailing by one run, the Astros faced Craig Kimbrel. Alex Bregman struck out swinging before Fisher lined an 0-2 pitch to center for a single. Norichika Aoki's at-bat was a lengthy series of foul balls and throws to first - fttcftftft - before he lined out to left. With an 0-1 count on Springer, Fisher took off for second. Vazquez fired down to second and Josh Rutledge put the tag on Fisher - and the game was over. Four of the Red Sox's last eight games have lasted more than four hours. Two of the four games went into extra innings; the two nine-inning affairs have clocked in at 4:06 (last Sunday) and 4:08 (tonight). As you've surely noticed, Price is walking a whole bunch of people. His current 3.71 BB/9 would be the second-highest of his career ... Not only that, but he's walking almost twice as many batters per nine innings this season than he did in 2016 (1.98 BB/9). ... Why such a jump? One answer might be that Price hasn't been able to rely on what was, last year, his best pitch: the changeup. This year, however, is a totally different story. He went from throwing the changeup for a ball 26 percent of the time to 37 percent of the time. It's also been a significantly less sharp pitch for Price, averaging an inch less in both horizontal and vertical movement this year compared to last. Batters are swinging at his change ten percent less often this year (53 percent) than last (63 percent), too. He's also throwing it less, going from 22.8 percent usage last year to 15 percent this season. Essentially, Price's most reliable and effective pitch has gone missing. ... While Price said the blister didn't affect him, he also talked in that same press conference about his lack of feel for the change up. The glimmer of hope? ... It's an unreliable sample size, but so far, opponents are only hitting .091 against his change this year. Despite Price shying away from using his change up, it's still generating whiffs at roughly the same clip this year (20.93 percent) as last (23.31 percent). There are encouraging signs that a Price turnaround might not be far away: his contact numbers have improved and his velocity hasn't dipped. Farrell: "One thing we've tried to do is not throw as many four-seamers up in the strike zone where it might be more difficult to get back down in the bottom of the strike zone. There's been a high number of two-seamers tonight [Saturday], but still, finding their way to the mid-thigh region, the belt region, and that can be trouble as we saw here tonight." Porcello: "I know what it is to fix. I'm just having a really hard time doing it." The Red Sox will keep sending Porcello out there, though. Farrell: "Honestly, there aren't any alternatives. Rick is a key member of this team, and we've got to continue to work to get it right." June 18, 1977: Yankees at Red Sox, on national television and in front of the largest Saturday afternoon crowd at Fenway Park in 20 years. Boston had won 9-4 the night before, hitting six home runs, including four solo shots off Catfish Hunter in the first inning; Hunter had been yanked after facing only six batters. In the bottom of the sixth on Saturday, the Red Sox led 7-4. After Fred Lynn singled, Jim Rice hit the ball into right field. Reggie Jackson was slow to field it, and Rice raced into second with a double. Martin, after the game: "If you don't hustle, I don't accept it. If a player shows up the club, I show up the player. ... He showed us up all over the country." The Yankees lost the game 10-4 and were swept the next day 11-1. Boston hit 16 home runs in the three games. Those games came during a stretch of 10 games (June 14-24) in which the Red Sox clubbed 33 home runs. Less than two weeks later, on July 4, the Red Sox beat the Blue Jays 9-6 at Fenway. Of Boston's 11 hits in that game, eight were home runs. (No baserunners for the first four innings - and then BOOM!) The 2004 team will always be my favourite Red Sox team, but that 1977 team has got to be solidly in second place. Mordecai "Three Finger" Brown won 20 or more games for the Chicago Cubs each year from 1906-1911. He logged 37 saves over that stretch, and he had two seasons where he led the National League in both complete games and saves. Amazing. In 1909, Brown led the National League in wins (27), games (50), innings pitched (342.2), complete games (32), and saves (7). In 1910, he led the NL in complete games (27), shutouts (6), WHIP (1.084), and saves (7). Brown also led the NL in saves in 1911 (13). In that season, he pitched in 53 games. He started 27 games (and completed 21 of them) and finished another 24 games as a reliever. And: Roger Clemens, on his baseball career (and seemingly a defense of his alleged steroid use): "I did it the right way and went out there and did what I had to do." The Sporting News called the riot at Fenway Park on June 16, 1917, "one of the most disgraceful scenes ever witnessed in a major league ball park". The atmosphere was tense from the start. ... As a steady drizzle came down from the sky, the crowd began to get restless. More trouble began brewing in the fourth inning ... Heavier rain began to fall, and a few fans from the outfield bleachers ran across the field to the covered pavilion, stopping play for several minutes. Cries of "Call the game!" began to be heard as the White Sox were retired in the top half of the inning. The refrain only increased in volume as Cicotte set down the Boston hitters in order; the Boston Globe reported that "it seemed as if every man in the bleachers was shouting." In the fifth ... John (Shano) Collins stepped to the plate for the White Sox [with two outs], all hell broke loose. 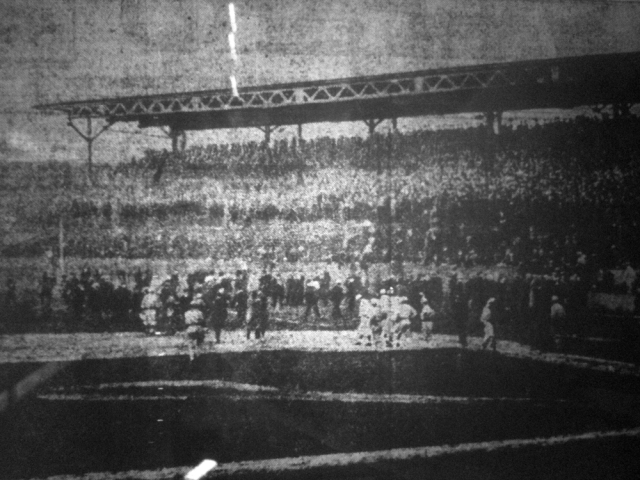 A crowd of about 300 fans from the right field bleachers, led by "some tall man in a long rain coat," suddenly began leaping over the fence and marching onto the playing field. Barry McCormick, a former Chicago Cubs infielder in his first season as a major league umpire, immediately called time and "stood gazing in amazement" to see what the crowd would do. But "they didn't rush at the players or umpires," the Chicago Tribune reported. "Instead of fighting, the mob simply surged out upon the field, clear up into the diamond and stood around." They were obviously stalling for time. If the rain continued, the field would soon be deemed unplayable and the game would have to be called off. ... There was still one out remaining before the game was official. Umpire Tommy Connolly ... looked around for police officers to help herd the mob off the field. He saw none. Five officers were somewhere in the stands, but they could not be found. ... Connolly and Red Sox manager Jack Barry, taking charge, approached the leaders of the mob and persuaded them to leave the field so the game would not have to be forfeited to Chicago. The fans did not retreat to their old seats in the bleachers, but climbed into the grandstand boxes instead. Just when play was about to resume, "new leaders and recruits came from the gamblers' stand ... then the first crowd piled out of the boxes again. This time, the mob was riotous." The trouble was started by the horde of gamblers that assembles each day in the right field pavilion and carries on operations with as much vigor and vim as one would see in the wheat pit of the Chicago board of trade. … The truth is that during [Boston's losing streak] the last two weeks, the gamblers here have been stung, stung for a greater amount than in years. When they saw they were likely to get another trimming and that it might be averted by breaking up the ball game, they incited the fans to riot. The teams eventually played nine innings - and the White Sox won 7-2. Rick Porcello (6-10-7-1-3, 101) had a bad night. Porcello did not retire any of the first four Astros in the first inning: George Springer doubled, Marwin Gonzalez reached on a bunt single, Jose Altuve doubled in a run, and Carlos Correa walked. Houston then got two sacrifice flies from Brian McCann and Carlos Beltran and took a 3-0 lead. The Astros doubled their lead to 6-0 in the third. Altuve led off with a home run to left center. Correa singled. One out later, Beltran homered to right. Porcello threw 64 pitches in the first three innings. Chris Young homered for Boston in the fifth. Austin Maddox made his major league debut when he relieved Porcello in the seventh. Maddox, a 26-year-old right-hander, has pitched for both Portland (10 games, 1.35 ERA) and Pawtucket (8 games, 1.32 ERA) this year. He retired the 2-3-4 hitters in the Astros' lineup on 10 pitches. Fernando Abad stranded a runner at third in the eighth, extending the bullpen's consecutive scoreless inning streak to 25. Astros starter David Paulino (6-3-1-1-4, 81) allowed four baserunners in six innings. 5th - Young led off with a home run. The Red Sox were retired in order in each of the final three innings (on 10, 8, and 13 pitches). The Yankees lost to Oakland 5-2 this afternoon - their fifth consecutive loss - so the Red Sox had an opportunity to move into a tie for first place. That will have to wait until tomorrow. Porcello has pitched at least six innings in all but one of his 14 starts this year. He is giving up a ton of hits, 114 so far this year, more than any other pitcher in MLB. Opposing teams have had at least eight in each of his last seven starts. On the plus side, Porcello is walking only 1.8 batters per nine innings (7th-best in MLB, 3rd-best in the AL). Paulino is making his fourth start of the season; he also appeared in three games last year for Houston. In 2017, he has allowed 10 earned runs in 13.1 innings (6.59 ERA). Tonight's game will be broadcast by Fox and Don Orsillo will be calling the play-by-play. The Red Sox are 17-8 since May 21 (.680), the best winning percentage in the AL. Only the Dodgers (17-7, .708) have a better record since that date. Red Sox relievers have not allowed a run in their last 24 innings, the club's longest such streak since a 25.1-inning stretch from July 11-August 28, 2009.
an ERA below 3.10 (2.90 in 1967). Joe Kelly has not allowed a run since May 1 (17 appearances: 15.2 IP, 10 H, 6 BB, 16 K). In his last 43 appearances - including the postseason - since July 26, 2016, Kelly has a 0.91 ERA. Craig Kimbrel leads all MLB relievers in WHIP (0.42) and opponents average (.078), and is #2 in K/9 (17.02). Leads AL relievers in strikeouts and is #2 in ERA (0.88). He has struck out 58 of 108 batters this year (53.7%). Opponents are 2-for-their-last-53 (.038). For the season, right-handed hitters are 2-for-59 (.034), with 32 strikeouts. On May 13, Jackie Bradley was hitting .171/.234/.286. Since then (30 games), he has hit .311/.423/.583 (1.006 OPS). In his last 25 games since May 17, Mitch Moreland has posted a .337/.406/.607 batting line (1.013 OPS). Mookie Betts's 113 extra-base hits since the start of 2016 lead the AL and rank #2 in MLB (Arenado, 123). Betts is 12-for-27 (.444) with eight extra-base hits in his last six games; 14 of his last 23 hits have gone for extra bases, including seven of his last 10. Betts leads the AL with 23 doubles. He also leads the majors with 65 doubles since the start of 2016 and 107 doubles since the start of 2015. Sandy Leon: 12 of his 16 RBI this year have come in the 7th inning or later. On Thursday, Dustin Pedroia struck out more than once for the first time since July 31, 2016, snapping a streak of 103 games without doing so. It was the longest streak by a Red Sox hitter since Wade Boggs went 105 games without striking out two or more times (April 12-August 20, 1992). Rick Porcello has struck out 50 and walked only eight in his last nine starts (56.1 innings). In his career, Porcello has issued 2.03 BB/9, the lowest rate in the AL among active pitchers, and the 2nd-lowest in the majors (minimum of 1,000 IP). Fernando Abad has a 1.93 ERA since May 1 (14 IP, .204 opponents average (10-for-49)). Matt Barnes's ERA split: 0.56 in 15 home games and 5.87 in 16 road games. Drew Pomeranz and Mookie Betts led the Red Sox to victory. Good Pomeranz showed up tonight (6.1-4-1-3-4, 97) and Betts scored both runs, the second one coming on his 12th home run of the year, in the eighth inning. Betts also threw out a runner at the plate in the sixth. Update: The Yankees (38-27) lost again, their fourth defeat in a row. Boston (38-29) is now only 1 GB! Betts walked with one out in the third. Pedroia singled to right, and Betts went to third. Xander Bogaerts struck out, but Mitch Moreland singled to left, scoring Betts. Mike Fiers's wild pitch moved the runners to second and third and Andrew Benintendi walked. But the bases were left loaded when Chris Young grounded out to shortstop. Pomeranz was helped out by double plays in the first and fourth innings. And in the sixth, after Pomeranz issued two-out walks to George Springer and Jose Altuve, Carlos Correa singled to right. But Betts gunned down Springer at the plate. There was also a bit of a scare in the seventh. Brian McCann homered off Pomeranz, tying the game at 1-1. Joe Kelly relieved Pomeranz. Yuli Gurriel doubled to right center and went to third on Alex Bregman's groundout. Derek Fisher was intentionally walked and Norichika Aoki pinch-hit for Jake Marisnick. It was a tense at-bat - ball, ball (Fisher stole second), called strike, swinging strike, foul, foul, ball, foul - before Aoki lined out to third, where Josh Rutledge had to leap to snag the ball. Fiers (7-5-1-2-4, 97) was pulled after seven and Will Harris took over, facing the top of Boston's order in the eighth. Betts crushed Harris's first pitch over the fence in left. In the bottom of the eighth, Altuve doubled off Matt Barnes with one out. Barnes then walked Correa on four pitches. Altuve stole third, but Evan Gattis grounded into a 6-4-3 double play. Craig Kimbrel retired the side in order in the ninth. The Astros (45-22) lead the American League West by 11 games. Since winning 11 games in a row (May 25-June 5), Houston has lost six of nine games. Fiers is the team's only pitcher from the Opening Day starting rotation to have avoided the disabled list. How do you solve a problem like Pablo? That's what the Red Sox are wondering as Mr. Sandoval turned in yet another putrid night at the plate. Rob Bradford writes that "the Sandoval signing is trending toward becoming one of the worst in franchise history". In 158 games with Boston, Sandoval is batting .236 with a .646 OPS. Dave Dombrowski said this week that the organization doesn't feel [Rafael] Devers is quite ready yet, but some of that probably involves the team not yet making the decision that it's time to cut Sandoval and give his roster spot to someone more useful. They should be there, though. Sandoval looks like a below-replacement level player ... the Pablo Sandoval experiment failed, and it's not going to be any more successful by letting him get at-bats that could go to a better player. More bad news: Roger Clemens will be filling in for Joe Castiglione on the radio broadcast tonight. Awful Announcing wonders "what WEEI has to gain" since Red Sox fans "seem to largely hate him at worst, and are pretty indifferent to him at best. ... [I]t sure seems to be pretty significant trolling of a large segment of their Red Sox-fan audience." 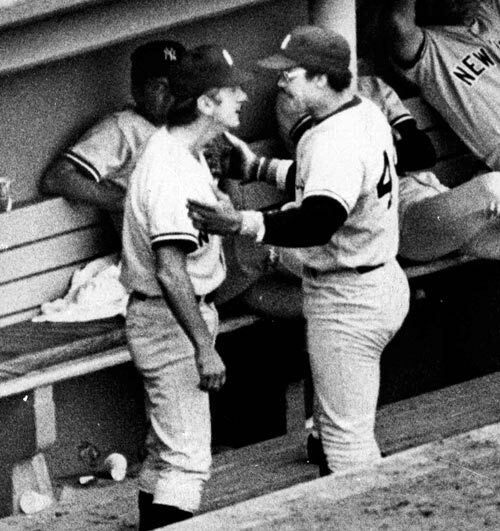 I won't listen to even one second of Fat Billy, but I am curious about how it goes, since Clemens was not known for his silver tongue during his playing days. So if anyone has the stomach to tune in, feel free to report in the comments.